The LG G6 comes out of the locker room for this one already a loser - you see, it's powered by last year's Snapdragon 821 chip and top-grade or not, it stands little chance against the eager youngsters. The Galaxy S8 comes in two flavors - either the latest Snapdragon 835, or the latest Exynos 8895. We've only reviewed the Exynos S8, but the Snapdragon S8+ will fill in to make the comparison more thorough. The Xperia XZ Premium is also using Qualcomm's newest silicon. It's business as usual and we kick things off with some GeekBenching - the latest 4.1 version in particular. The Exynos-powered S8 leads the way in both single-core and multi-core, its Snapdragon stablemate staying relatively close. The Xperia's single core result matches the one of the S8+ with a S835 inside in single-core, but fails to keep up when all cores are pushing hard. One of the G6's Kryos is still relevant all by itself, but 4 is fewer than 8 and it shows in the multi-core results. 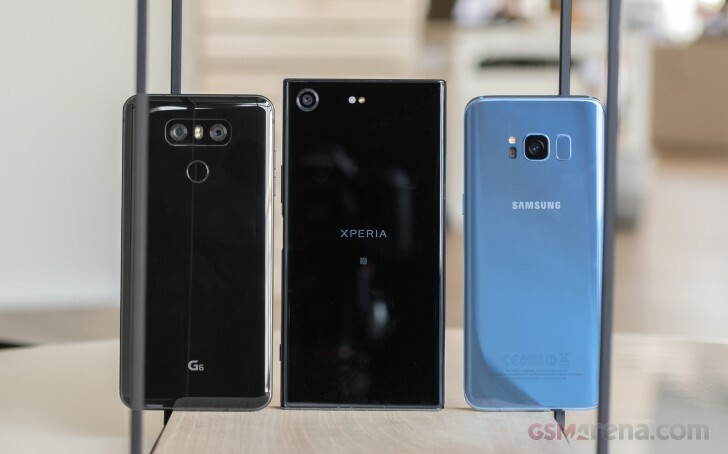 The hugely popular Antutu 6 benchmark seems to think that the Xperia XZ Premium belongs with the G6 instead of the S8s of this world - we're not entirely sure what's going on here. The numbers from Basemark OS II 2.0 (we're not sure we'll ever learn to live with that designation) put the two Galaxies close together, with the Xperia a notch below, and the G6 struggling to keep up. On to graphics-only testing, we'll start with Basemark ES 3.1. 20 cores of Mali-G71 GPU raw power rule in this OpenGL 3.1-specific benchmark, and the Adreno 540 fails to keep up. The Xperia XZ Premium edges ahead of the Snapdragon S8+, while the G6 serves to show the jump in GPU power brought about by the newest chips. In the OpenGL 3.1 bits of GFXBench there still is a difference between the differently-specced Galaxies - a single frame per second in the heaviest Car Scene test, but 5fps in Manhattan. The G6 is considerably behind in both disciplines. Don't be fooled by the Xperia's super high onscreen framerates - those tests are apparently rendered at 1080p instead of the native 2160p. In the offscreen runs, the XZ Premium is on par with the Galaxies. We make a quick return to the Basemark suite for the graphics-only X. The Xperia XZ Premium is doing a reasonably good job keeping up with the Exynos S8 in this one, which can't be said about the Snapdragon version of Samsung's flagship. The G6 is again last in this chart. Winner: Samsung Galaxy S8. A predictable showing from the three phones in the benchmarks - the Galaxy S8 in Exynos trim is the usual chart-topper, followed closely by the Snapdragon 835-powered S8 and the Xperia XZ Premium. The LG G6 does the best with what it's got, but the last gen chip can't compete in the numbers game. That said, you'd be hard-pressed to find a substantial difference in the behavior of the devices in actual use.